What’s the best time to send emails, and how often should I send them? We built Seventh Sense to answer these two questions, so as a company whose original product was send time optimization/personalization, finding the single best time to send marketing emails to our subscribers has never been our goal. We’ve done many A/B tests over the years showing the benefits of personalizing send times. But for the sake of science, earlier this year we decided it was time we run a multivariate test against our own algorithm to see how its top time predictions stack up. Normally we send our newsletter over 7 days using 100% personalized delivery times like you can see below. This ensures that we get the maximum bang for our buck from every email. This time however, we sent out our newsletter over 24 hours using a flat/randomized distribution instead of letting our machine learning algorithm pick the best times to send each email. Think of this like running a multivariate test, testing how much engagement we get each hour of the day and night. For contrast, compare the graph above with the one below. The graph below shows the how many emails would have gone out each our if we had let Seventh Sense select the email send times. Not surprisingly, like most B2B audiences, Seventh Sense predicted the largest portion of our audience will engage about 9am EST. But note how many people are predicted to engage outside of that window as well. So what was our optimal delivery time? Take a look at our results from HubSpot below. Look familiar? The engagement graph is remarkably similar to how Seventh Sense would have scheduled our delivery. Unfortunately, the biggest difference is that our overall engagement, while nicely fit to our predicted top times, is lower than it would have been had we let Seventh Sense schedule the mailing. Looking a bit closer some interesting trends appear. 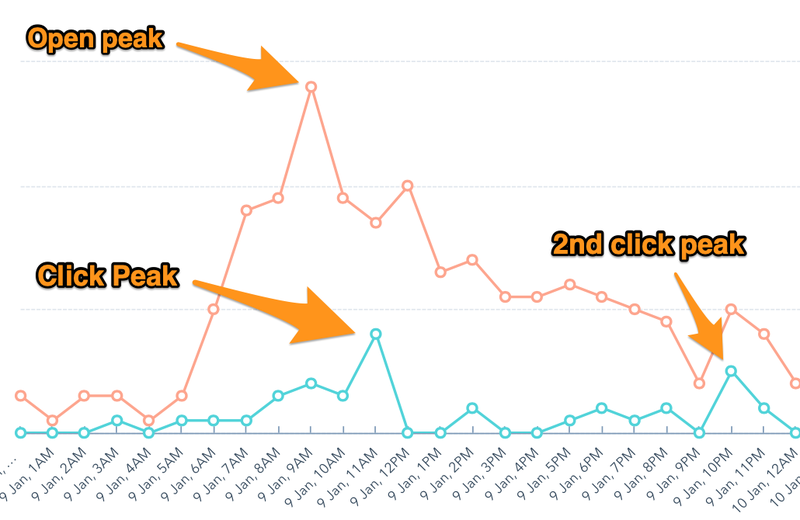 Our open rate peak is as expected, 9am, but our peak click rate is actually at 11am. From an open rate perspective, 11am is actually the worst time to send in the 6am to 12pm window. Clicks are a much stronger measure of engagement than opens. So Seventh Sense is designed to model engagement by assigning a higher weight to clicks than opens. Desktop clicks receive the most weight and mobile opens the least. The mailing stopped going out at 12am, but people continued to engage all throughout the night. This is likely due to our international audience and people engaging across time zones, but could also be because we do have a few night owls in our audience. Remember, 3am PST is already 6am EST and a lot of people, especially decision makers, are up and working by 6am. Not surprisingly our first morning peak the day after delivery comes at 6am, followed by another peak at 9am. 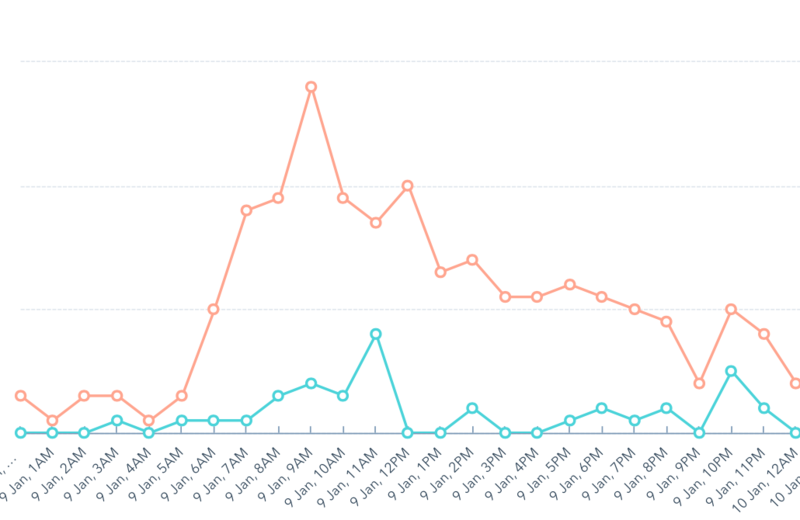 12 hours after the final emails were delivered engagement drops dramatically. There’s virtually no engagement after 8pm, just 20 hours after the last email went out. This isn’t really surprising and aligns with other research that's found the chances of an email being opened after 24 hours drop to below 1%. Is 10pm the new best time to send B2B emails? Another interesting finding is that despite conventional wisdom, we had our second highest click rate at 10pm. This is a pattern we've seen with B2B email newsletters in the past. Decision makers and business owners in particular tend to do their research and reading in the evening, not at 9am during the work week. So even though only a small portion of your audience engages in the evenings, they may be your most important segment! If you send all your emails out at 9 or 11am because that's your peak list time, your emails may be buried in your target audiences inbox by the time evening rolls around. Note, I’m on the west coast, so 5am on the profile is actually 8am EST. For this person, early in the day is clearly the best time to send business emails. But the fact of the matter is just about anytime during business hours will work for a 9-to-5er if their job involves working in front of a computer. Compare the 9 to 5er profile to the profile below. Both of this and the profile below come from C Level executives. The overall time range they are responsive to email is much wider, but at the same time, you don’t see the same large consistent blocks of availability. Another common trend we see with executives is activity on weekend evenings. Many high achieving business people get their research done or catch up on email on Sunday night. If you're not familiar with how Seventh Sense finds the best time to send emails, our system analyzes the historic engagement patterns for each person in your marketing automation platform. From this ongoing analysis, Seventh Sense builds an ever-improving model to predict when each subscriber on your list is most likely to engage. As a marketer, this means that instead of blasting your email out all at once, your emails get sent out over a time period of your choosing. You can run an email campaign over as short as an hour or all the way up to 7 days. The longer the period, the more send time optimization the system can produce. For new people added to your database, Seventh Sense chooses a random time within your delivery window. With each new engagement, their profile becomes more accurate. We’ve found that using this randomization strategy builds a smarter dataset and actually increases engagement more than sending to new contacts at the list's top engagement time. 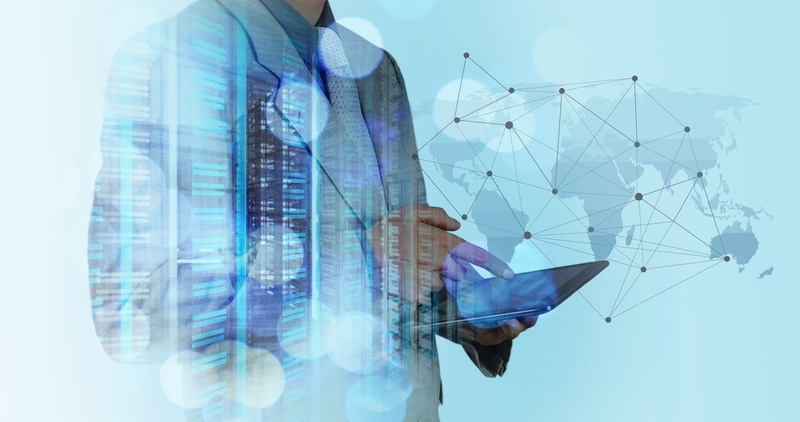 Less likely to trigger corporate spam filters - By using send time optimization to choose the best time to send your marketing emails, you also are in effect naturally throttling or rate limiting your emails. This has several positive effects including improved deliverability, especially if you are emailing many people at the same domain. Improved deliverability - While email service providers are very secretive about their filtering processes, it’s likely that one of the factors used in identifying “bulk senders” is how many emails you're sending at a time. For this reason, simply throttling outbound email can help land more messages in the inbox by helping you avoid triggering spam filters. Even out demand - Another issue with the traditional email blast was that it causes spikes in demand. Sending an email blast to a list can have the same effect on demand as running a television or radio ad. Once the email is out, demand is near instantaneous. This can cause overload to call centers, or lead to frustrated customers if an item is out of stock. Lowered risk - Sending to a new list of subscribers from a new lead generation campaign but worried about your bounce rate? Test it out with Seventh Sense. The natural rate limiting will improve your deliverability and also allow you to pause the campaign if the bounce rate you are seeing is unacceptable. Are you a HubSpot or Marketo user interested in learning more about how Seventh Sense can help you get a higher ROI from email? Book your free consultation today.